Automobile giant Nissan’s iconic car, Murano, is now available in Europe with a diesel engine bringing it up to the class of a car that every man desires for. 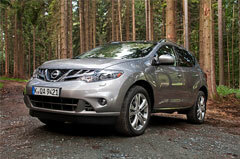 A midsize crossover SUV, introduced in 2003, Murano has been a hit for years even without the diesel engine. That was the one thing that needed to be added to its expressive armoury to deliver its full potential. This was the only obstacle that the Murano had where other manufacturers gained ground and cashed in, namely, Land Rover and Mitsubishi. With the introduction of the diesel engine, the Murano dCi model is expected to push upsales by 90% in the diesel segment alone. Priced at £37,795, the model hits showrooms on September 2010. Whether the Murano owners choose the petrol or the diesel version of the car, they will enjoy every bit of the benefits that come with the drive. Features on offer are a rich specification list that include 18 or 20 inch alloys, next generation combined audio and navigation systems with Hard Disk based navigation, DVD player, music box, iPod, USB, Bluetooth and touch-screen interface. The high grade audio installation is an 11 speaker BOSE system with ten channel amplification, tailored to the Murano’s interior to give an outstanding surround experience. In addition, the equipment list includes rear privacy glass, bi-xenon headlamps, cruise control and Murano’s signature electrically folding rear seats, which can be raised or lowered easily and conveniently from the rear trunk. The new diesel version is powered re-engineered version of its former engine, the Nissan’s 2.5-litre common-rail four-cylinder unit. Engineers from Nissan Technical Centre Europe (NTCE) have made extensive changes to the engine to ensure its performance is in accordance with customer expectations in this segment of the market. It is now fully compliant with tough Euro5 emissions standards, and develops more 11% power and torque than before at 200RPM. Capitalising on the need to meet the requirements for cooling airflow to the diesel engine and radiators, a significant update has been made to the Murano’s frontal aspect to reinforce its striking looks. With a new grille and bumper design, the styling is now even more elegant and masculine. All of this comes with a full set of airbags, steel reinforced interiors for protection, technology that lets you choose between four wheel drive and two wheel drive. The new Murano, is a “ a win-win solution,” says, Simon Thomas, Nissan’s European Senior Vice President for Sales and Marketing. Who Pays When An At-Fault Driver Doesn’t Carry Insurance?